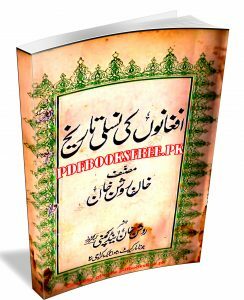 Afghano Ki Nasli Tarikh authored by Khan Roshan Khan. Afghano Ki Nasli Tareekh is another important and informative book on Pashtun tribes’ history. The present book contain an ethnic history of the Afghan (Pathan) tribes. It discussed the race and origin of the Pashtun nation in Urdu language. Khan Roshan Khan is a well-known Pashtun historian. He was one of those historians who believe that Pashtun are Bani Israel (The children of Prophet Yaqoob a.s). Khan Roshan wrote several book on Pashtun history. These books are listed below. Afghano Ki Nasi Tareekh book is now available on Pakistan virtual library for online reading and download. Check out the following links to read online or download the complete book in Pdf format for offline reading and references.